Chinese subjects who enjoyed spicy foods appeared to eat less salt and have lower blood pressure, potentially reducing their risk of heart attack and stroke, according to new research in the American Heart Association’s journal Hypertension. The study enrolled 606 Chinese adults and determined their preferences for salty and spicy flavors. Researchers then linked those preferences to blood pressure. consumed less salt than participants who had a low spicy preference. Researchers also used imaging techniques to look at two regions of the participants’ brains — the insula and orbitofrontal cortex — known to be involved in salty taste. They found that the areas stimulated by salt and spice overlapped, and that spice further increased brain activity in areas activated by salt. Authors said that this increased activity likely makes people more sensitive to salt so that they can enjoy food with less of it. All participants of this study are from China, so further research is needed to determine if these findings may be generalized to other countries. Salt and sodium are often used interchangeably, but they are not the same. More than 75 percent of the sodium Americans eat comes from processed, prepackaged and restaurant foods – not from the salt shaker. 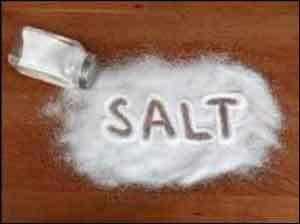 The American Heart Association recommends no more than one teaspoon of salt (2,300 mg sodium) or less per day.